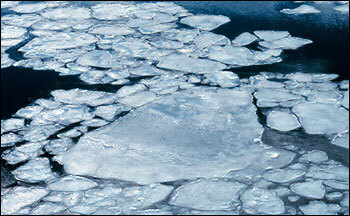 In Part A, students will learn about how sea ice forms and influences ocean currents around the globe. In Part B of the investigation, they will look at how sea ice thickness changes over time. 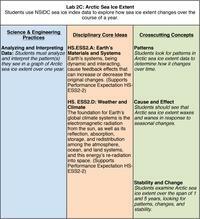 Finally, in Part C, students will use NSIDC sea ice index data to explore changes in sea ice extent on multiple time scales including months, years, and decades. In Part B: Students examine a plot of sea ice thickness over the course of a year to help them understand the role of heat transfer between the cryosphere and atmosphere. They then consider the dynamic forces that influence sea ice thickness and watch a short YouTube video showing the vertical undulating motion of sea ice. Next, students interpret images showing how sea ice age (thickness) has changed in recent years and learn about the Arctic Oscillation, a large-scale seesawing weather pattern that affects sea ice extent and thickness. Interested students can use the Measuring Sea Ice Thickness Power Point presentation under How Do We Know What We Know?, as a launching pad for further investigation of some of the tools and techniques scientists use to measure sea ice thickness. In Part C: Students focus on sea ice extent, looking at how sea ice extent varies on seasonal and annual time scales. They will create an animation of Arctic sea ice extent changes over the course of one year and then five years using the National Snow and Ice Data Center's Sea Ice Animation Tool. They will then use Microsoft Excel or another spreadsheet program (if available) to plot monthly sea ice extent for one year. Part C ends with a wrap-up discussion about what students have learned about sea ice formation, extent, thickness, and changes over time. In Part A: If time or supplies are limited, the density/circulation experiment can be done as a front-of-the class demonstration. Have students watch the video on a mobile device such as a smart phone or tablet that runs on a 3G/4G connection rather than the school's internet or wireless connection. Have students watch the video on a home computer where YouTube is not blocked. Use a converter site such as Convert.Files to download the YouTube video to a personal computer, CD, or memory stick outside of school and project the video for students to watch as a class. In Part C: To save time, you might consider assigning a different year to different small groups of students rather than have all groups collect and graph data for all 5 years. Purpose of the discussion: In this lab, students were introduced to Arctic sea ice, which helps regulate ocean circulation and global climate. Use this discussion opportunity to make sure students understand the role of sea ice and why it is important for scientists to monitor and understand how it changes over time. Primary discussion question: Why is it important to understand how sea ice changes over time? What causes sea ice thickness and extent to change over time? What types of changes do scientists expect to see in sea ice over a year? over 5 years or more? Wrap Up: Even though sea ice is found primarily in the polar regions, it influences the whole world. Changes in the amount of sea ice can disrupt normal ocean circulation, which directly impacts global climate. Sea ice is also highly reflective and plays a large role in keeping the planet cool. As they continue through the cryosphere unit, students will learn more about the importance of sea ice as a climate indicator. 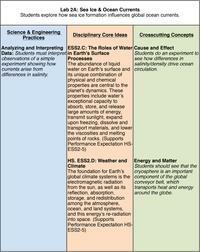 Have students write down the learning objectives for Lab 2. In Part A: Have students take notes and record reactions as they watch the Icy Finger of Death and global conveyor belt videos. For additional background information about the processes involved with the growth and melt sea ice, read the NSIDC sea ice primer Processes: Thermodynamics. Read through this NOAA tutorial on the Global Conveyor Belt to familiarize yourself with how the formation of sea ice influences global ocean circulation. For additional background information about sea ice dynamics, read the NSIDC sea ice primer Processes: Dynamics. To learn more about Arctic sea ice trends, read the NASA Earth Observatory Feature Article Dwindling Arctic Ice. 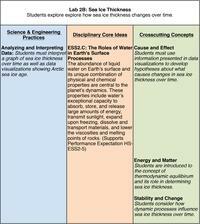 If time and circumstances allow, consider having students make their own sea ice. The Earth Exploration Toolbook Chapter Whither Arctic Sea Ice? walks users through techniques for analyzing sea ice extent data with image processing and spreadsheet software.